Welcome to Scott Bennett antique clock case & fine furniture restoration based in Oxfordshire - Longcase clocks specialists. At Scott Bennett 'Antique Fine Furniture & Clock Case Restoration', I am dedicated to restoring your antique furniture and clock cases, especially longcase clocks to their original beauty. 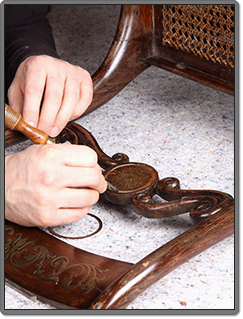 The attention to detail and exceptionally high standard of restoration, places your treasured antique in more than capable hands. I specialise in 'antique fine furniture restoration', 'antique clock case restoration' and 'cabinet making' for private clients, collectors and antique dealers. I provide a high quality and extremely reliable service to clients, including a collection and delivery service to the whole of Oxfordshire and surrounding counties. One other special service I provide is reproducing copies of antique chairs to match an existing set. Contact us regarding any enquiries. Scott Bennett Antique Furniture & Clock Case Restoration. © 2012 Scott Bennett Antique Furniture Restoration www.sbantiquerestoration.co.uk. All Rights Reserved.